Texas Housewife: Yikes! Yellow Jackets! Dab ammonia on the sting. Make a paste of meat tenderizer and water, then dab on stings. Make a paste of baking soda and water, then apply to stings. Rub tobacco on the stings. Pat some diluted bleach on the stings. Now I'll admit some of these suggestions sound painful. I ended up washing the stings in cold water with antibacterial soap. I then applied ice packs. After the initial pain and swelling had went down, I made the baking soda paste and used it. It worked quite nicely. Today I still have some itching, but the baking soda mixture is helping with that. NOTE: If you are allergic to such stings or start having a systemic reaction, seek medical help immediately. I am very allergic, so I took two Benadryl the minute I got back in the house. 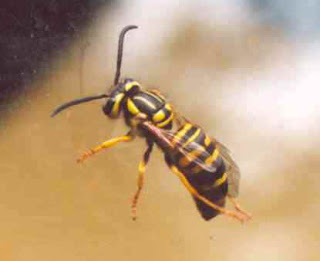 Also, I learned that unlike bees, yellow jackets DO NOT lose their stingers, so they can sting you multiple times. I just thought I'd pass this tidbit of information along. It is the time of year for picnics and BBQs, so these pesky insects will be out and about more. I was happy to have so quick, in a pinch remedies for those times you don't have the pain relieving anti-itch spray handy.